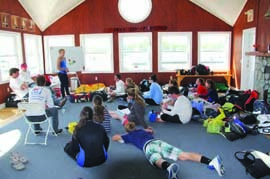 “They learned a lot about themselves as athletes and people on how far they could push themselves,” said Olympic gold medalist Anna Tunnicliffe, talking about the junior sailors she coached in big air conditions at the annual Carl Van Duyne Memorial Advanced Racing Clinic on Memorial Day weekend at American Yacht Club in Rye, NY. This was the fourth consecutive year that AYC has hosted the clinic, which is run by LISOT (Long Island Sound Youth Sailing Team) and, for the first time this year, combined with the Junior Sailing Association of Long Island Sound Advanced Racing Clinic. This year’s clinic had some of the country’s best junior sailors and Olympic coaches experience an unforgettable 3-day weekend of learning, training, friendship and fun sailing I420s, C420s and Lasers. “The Van Duyne Clinic was a great opportunity for area sailors to jump-start their summer sailing season,” remarked Olympian Rob Crane, who coached the Laser group with Anna. Things got off to a bang on Saturday morning as the big boats that had just finished a record-setting Block Island Race were returning. That’s because clinic sailors were greeted with what the Block Island sailors has just enjoyed: a 30-knot northwesterly with temps in the 40s. Fortunately, the driving overnight rain that accompanied the Block Island Race had abated by the start of the clinic. “This is Long Island Sound…it’s never really like this” was heard around the boat park as the sailors rigged on Saturday morning while Mother Nature was sending her best from the Northwest. “In spite of the very cold and windy conditions, the sailors and coaches trained at a very high level,” said veteran Olympic coach Dave Dellenbaugh, who was coaching the 420s. Steve Keen, US Olympic Sailing 2012 Development Sailor of the Year, LISOT Head Coach and Head Coach for this clinic for a number of years now, has always brought together a group of who’s-who coaches for this event. And this year was no different. “The sailors had a tremendous opportunity to work with some great coaches,” said Keen. Those coaches included Olympians Tunnicliffe and Crane, veteran Olympic coaches Dellenbaugh and Skip Whyte, I420 World Champion coach Nik “The Greek” Drougkas who flew in from Greece for the clinic, and Keen. With such breezy conditions forecast for the weekend, Steve also arranged for former LISOT sailors (now collegiate sailors) Olivia Crane (UVM), Ryan Schmitz (BC) and Alex Whipple (URI) to assist with coaching. In addition to the Olympic-level coaches, the level of sailors attending the clinic was high, including three of the four US Sailing Olympic Development I420 teams, and the Boys and Girls I420 teams that will be representing the USA at this years’ ISAF Youth Worlds in Cyprus. After breakfast, rigging and welcoming comments on Saturday morning, the sailors broke up into small groups of 6 – 8 for focused briefings with their coaches prior to launching. The more experienced sailors headed out in some serious big air conditions, planing right past the AYC docks on their way into the Sound in a blustery northwesterly breeze that kept the seas remarkably flat. For the sailors new to the Laser and 420, including some who had just transitioned out of Optis, this was a great weekend to get a jump on the summer ahead. Saturday’s heavy air conditions were good for learning about boat set-up and dry-land training, especially the choreography for the 420 skipper and crew of trapezing, hoisting, jibing and dousing a chute. It was all a bit different than the Optimist. On Saturday night, AYC hosted a fun barbecue at the Junior Club House. Monday finally brought conditions more familiar to western Long Island Sound in the spring. With bright sun, the land heated up to 70 and the breeze backed into the normal west-southwesterly seabreeze at around 8 -12 knots. Sailors were launched by 10 am, and spent a third day racing and training before coming ashore around 3 pm. After packing up their boats for the trip home, sailors gathered for a final debrief with their coaches and then hit the road at 5 pm. American Yacht Club provided an outstanding venue for learning and fun. Clinic Chairs Wendi and Scott Florio and Betsy Robertson, along with AYC Waterfront Director Kevin Broome, had every base covered throughout the event. 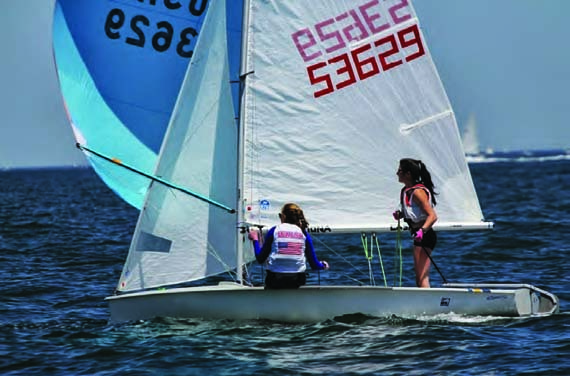 Named in memory of 1968 Olympic Finn sailor Carl Van Duyne, from Mantoloking, NJ, this clinic was first run in the late 1980s in the Mantoloking area and, after a pause in the early 2000s, moved up to Long Island Sound a few years ago.